New Immunization Requirements for PA Schools This Fall…The Pennsylvania Department of Health has revised Pennsylvania’s school immunization requirements for the 2017-18 school year. The new rules require parents to get their children fully immunized prior to the fifth day of school or the students will be excluded from school. Previously, parents had eight months to meet school immunization requirements. If a student is in the middle of an immunization series and it is too soon for the next dose, the parents must provide the school nurse with a written plan, signed by their health care provider, within the first five days of school. For more information, contact your health care provider, visit www.health.pa.gov or call 1-877-PA-HEALTH. Tax Amnesty Nets State $114 Million…Pennsylvania’s latest Tax Amnesty Program brought in $114.5 million, surpassing the $100 million net revenue previously estimated. The Tax Amnesty Program waived all penalties and half of the interest for eligible individuals or businesses that applied to the program and paid delinquent state taxes between April 21 and June 19, 2017. Taxpayers who were eligible but didn’t participate in the program will now be assessed a 5 percent penalty. Tax amnesty is not a forgiveness of debt but a reduction in fines to encourage payment. Anyone who took advantage of this program will not be eligible to do so again should the Commonwealth enact a subsequent amnesty program. The proceeds generated will apply toward the 2016-17 fiscal year, which ended June 30. Free Potassium Iodide Available on Aug. 24… As part of its annual distribution to replace expired potassium iodide, or KI tablets, the Pennsylvania Department of Health will offer free tablets on Thursday, Aug. 24, from 2-7 p.m. at the Hummelstown Chemical Fire Company (249 E. Main Street, Hummelstown) and the Middletown Borough Building (60 W. Emaus St., Middletown). Individuals can get KI tablets for other family members or those who are unable to get it on their own. Directions detailing when to take the tablets and how to store it are provided with the KI, and department staff will be available to assist those with questions. KI tablets are also available year-round at county and municipal health departments or state health centers for individuals who live or work near a nuclear power plant. Additional information on KI tablets and nuclear power plant safety can be found at www.health.pa.gov. Protecting You from Scams…To better protect consumers from financial scams, the Office of Attorney General has created a unit dedicated to consumer financial protection. The effort will focus on lenders that prey on seniors, families with students and military service members, including for-profit colleges and mortgage and student loan servicers. If you think you’ve been scammed, call the attorney general’s office at 1-800-441-2555 or send an email to scam@attorneygeneral.gov. In 2016, the Office of Attorney General’s Consumer Protection Bureau handled 19,727 consumer complaints and returned a total of $8.5 million in restitution to consumers. Free Cervical Screenings, Mammograms Available…Women who are uninsured or underinsured can receive free cervical cancer screenings and mammograms under the Pennsylvania HealthyWoman Program. The program is funded by the Department of Health and the Centers for Disease Control and Prevention. The program is open to women ages 40-64, who are Pennsylvania residents and have a gross household income below 250 percent of the federal poverty annual guideline, about $61,500 for a family of four. If breast or cervical cancer is detected through the HealthyWoman Program, the individual may be eligible for free treatment through the Department of Human Services’ Breast and Cervical Cancer Prevention and Treatment Program. For more information, click here or call 1-800-215-7494. 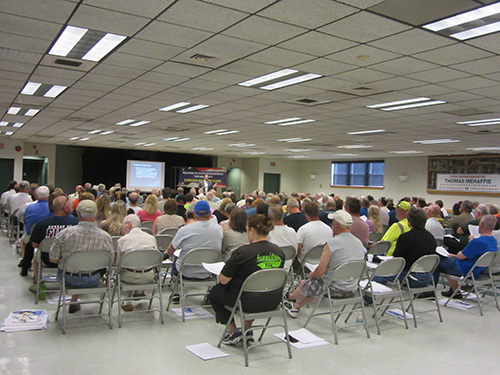 Thank you to everyone who attended my Concealed Carry Class last week! Attorney Matt Menges and Officer Anthony Clements of the Derry Township Police Department provided excellent information about our state gun laws and how to safely interact with law enforcement while carrying. **If you attended my Concealed Carry Class on Aug. 3 and did not obtain a trigger lock at the event, please contact the Hershey office at 717-534-1323. Dauphin County Sheriff Nicholas Chimienti Jr. has provided us with additional locks for those who didn’t receive one. Please call to reserve yours, as quantities are limited. Maria Goldman, a Hershey High School student, was named the 2017-18 Pennsylvania Students Against Destructive Decisions (SADD) Student of the Year. She was also appointed to SADD National Student Leadership Council. It was really nice to sit down and talk with Maria about all the great things that SADD does for our youth. 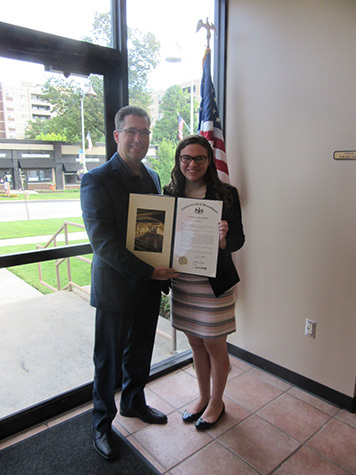 Before she left, I presented her with a House of Representatives citation in honor of her new roles. SADD, the nation’s leading peer-to-peer youth education, prevention and activism organization, is committed to empowering young people to lead initiatives in their schools and communities. Thanks for taking the time to come talk to me, Maria! Keep up the good work! I recently toured the Life Lion hangar in Derry Township, where I learned about program operations, safety and patient care capabilities. Life Lion provides critical care transport service within the 14-county Southcentral Pennsylvania region. Thanks to Penn State Health and the Life Lion team for this unique opportunity! 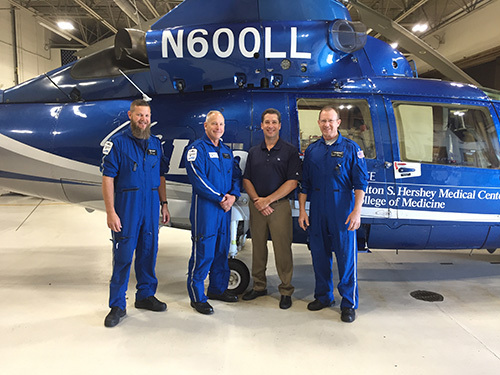 A very special thanks to Dave (left), the in-flight RN; Mike (second from left), the in-flight EMT; and Randy (right), the pilot; for taking time out of your day to show me just how important Life Lion is to our community. 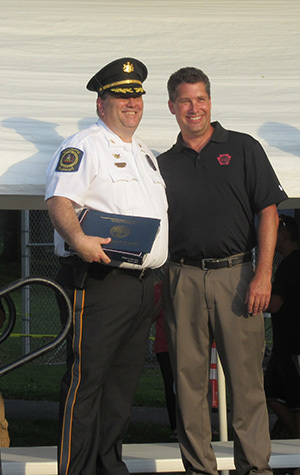 I was very pleased to be a part of Swatara Township’s National Night Out celebration on Aug. 1, as new Swatara Township Police Chief Darrell Reider was sworn in by District Judge Mike Smith. Congratulations and thank you to my long-time friend, Chief Reider, for your willingness to serve and protect our community! It’s been a pleasure to see you move through the ranks. 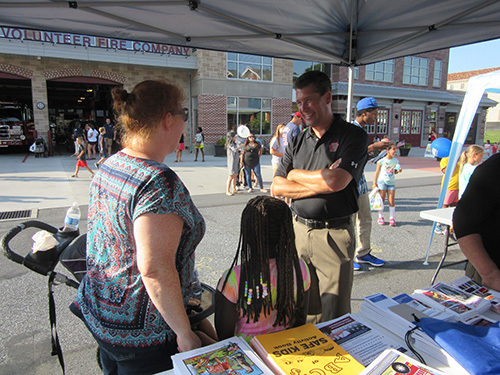 My staff and I also enjoyed participating and meeting residents at the National Night Out events in Hummelstown Borough, Derry Township and Middletown Borough. I enjoyed meeting many 106th District residents whom I hadn’t yet had the opportunity to meet. All of our local events were very well done and very well attended. Congrats to everyone who helped organize them!